From the La Mancha region and made by cheesemaker's Gómez Moreno Cheeses, who have been making cheese in this area since the 19th Century and was started by a family of shepherds. Head cheesemaker Jose Miguel uses a 100 year old recipe and only the unpasteurised milk of the indigenous Manchega sheep to produce the ‘Carpuela’ range of manchegos. 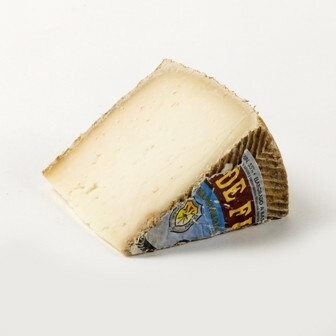 ‘Carpuela’ refers to Bernardo Carpuela a local, legendary cheesemaker of the 19th Century. As a PDO cheese, Queso Manchego to give it its official name, must meet the following requirements to be named as such. It must have been produced in an area that is restricted to designated parts of the provinces of Albacete, Ciudad Real, Cuenca and Toledo that lie within the La Mancha region. It can be made only with the whole milk of sheep of the Manchega breed that are raised on registered farms within the designated area. The cheese must have been aged for a minimum of 30 days for cheeses weighing up to 1,5 kg and from 60 days up to a maximum of 2 years for larger cheeses. Finally, the cheese must be produced by pressing in a cylindrical mould that has a maximum height of 12 cm (4.7 in) and a maximum diameter of 22 cm (8.7 in). Aged for 2-4 months this young manchego has flavours of sweet, fresh grass with a nuttiness much more subtle than older examples. Its texture is moister, smoother and more pliant than the curado (vintage) Manchego. This cheese is not currently available for sale online. Please visit our stores in London, Bath & Stratford Upon Avon for a wide selection of cheese.